Then Bernadette disappears. It began when Bee aced her report card and claimed her promised reward: a family trip to Antarctica. But Bernadette's intensifying allergy to Seattle—and people in general—has made her so agoraphobic that a virtual assistant in India now runs her most basic errands. A trip to the end of the earth is problematic. To find her mother, Bee compiles email messages, official documents, secret correspondence—creating a compulsively readable and touching novel about misplaced genius and a mother and daughter's role in an absurd world. 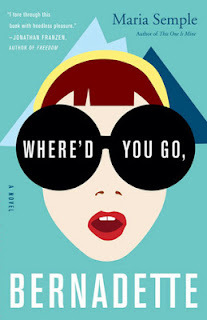 Where'd You Go Bernadette has received wonderful reviews since its release and has been on my want-to-read list for a while. So, when I knew I was going on vacation, I decided to take a break from my ever-expanding, must-review pile and picked up a few novels I’ve been wanting to read for a while. Sadly though, Where Did You Go Bernadette disappointed me and I found myself speed reading through it so I could finish and move on. I suspect this in part is due to the fact that I had no idea I was going to be reading a satire, so my expectation of a serious read left me confused and by the time I figured it out, I wasn’t as interested as I might have been. 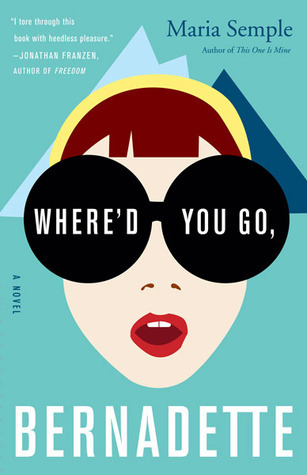 When I first read the description of Where'd You Go Bernadette, I thought the novel was about a girl searching for her mother who disappeared. This is true, but I became confused when I found myself reading Bernadette’s emails without an explanation about why we were privy to them. Narrative was sparse in this novel, and the majority of the book was correspondence via emails, letters and even articles, interviews and reports. It took me some time to figure out what was going on, and by the time I was told that this was what Bee pieced together after her mother disappeared, I was kind of over it. Once I clued in that I was reading a satire I could sit back and enjoy it a little more, but I still remained disappointed. There were a few surprises and some character growth, but I never really warmed to any of the characters and found Bernadette to be really whiny and very negative. The intense dislike of Canadians the author portrayed, satirical or not was disheartening. Again, this is all probably because I wasn’t expecting the novel to be humourous. Sometimes Bee seemed much younger than her age to me, but I’ve seen some less mature fifteen year olds, so it didn’t surprise me, but at times I wondered about it and it then her real age would confuse me. The few scenes I really enjoyed were the actual scenes, the ones between Bee and her parents. Pick this one up if you're looking for something a little different. That book sound seriously amazing. I may just have to add it to my weekly reading! I keep reading good things about this novel. I'm going to go buy it right now.